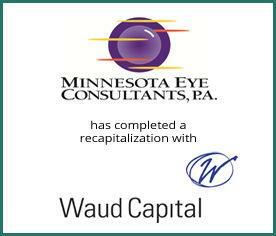 Minnesota Eye Consultants, PA (MEC) has completed a recapitalization with Waud Capital Partners, LLC to form United Vision Partners Holdings, LLC. MEC is a provider of primary eye care and surgical eye care services in the Minneapolis-Saint Paul metropolitan area. MEC operates out of six locations, four of which are laser and refractive eye centers and include Ambulatory Surgery Centers. Provident Healthcare Partners served as exclusive financial advisor to MEC. The terms of the transaction were not disclosed. “The partners, leadership and employees of Minnesota Eye Consultants are excited about the next stage of opportunity provided by this partnership. We have worked hard with both Waud Capital and Provident Healthcare Partners to structure this in a manner that will be good for our patients, the eye care community, and our employees.” commented David R. Hardten, MD, one of the founding partners of Minnesota Eye Consultants. “Minnesota Eye Consultants has developed an industry-leading clinical reputation as one of the premier ophthalmology groups in the country. The organization is poised for strong growth and an expansion of its best practices through leveraging Waud Capital’s portfolio expertise and relationships in the eye care industry,” noted Eric Major, Senior Associate at Provident Healthcare Partners. Minnesota Eye Consultants, founded in 1989 by Dr. Richard Lindstrom, is solely focused on the delivery of eye care services. The Company’s core competencies include refractive surgery, cataract and implant surgery, glaucoma treatment and surgery, cornea treatment and surgery, consultative ophthalmology, optometry, oculoplastics, specialty contact lens fitting and optical services. For more information, please visit http://www.mneye.com/. Founded in 1993, Waud Capital Partners is a leading middle-market private equity firm that partners with exceptional management teams to create, acquire, and/or grow companies that address significant, inefficient, highly fragmented and underserved industry segments. Waud invests primarily through control-oriented growth equity investments, industry consolidations, buyouts or recapitalizations and seek companies that generate strong cash flow and can be grown both organically and through add-on acquisitions. For more information, please visit http://www.waudcapital.com/. Provident is the leading investment banking firm specializing in merger and acquisition advisory, strategic planning, and capital formation for middle-market and emerging growth healthcare companies. The firm has a vast network of high-level, senior industry contacts, comprehensive knowledge of market sectors and specialties, and unsurpassed experience and insight into the M&A process. Provident uncovers value and opportunities that others often overlook to create transaction premiums for its clients. For more information, visit the Provident website www.providenthp.com.